Every-bunny loves our Deluxe Collection! 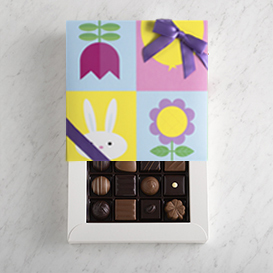 Our 16 best selling flavors in one box, topped with a bright and festive Easter Topper. The perfect Easter gift. 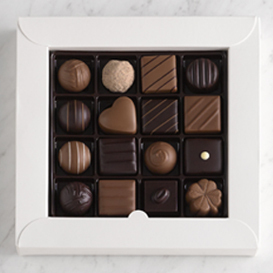 Deluxe Collection Ingredients: Swiss Milk Chocolate (Sugar, Cocoa Butter, Whole Milk Powder, Cocoa Mass, Lactose, Skim Milk Powder, Barley Malt Extract, Soy Lecithin, Vanilla), Cream, Swiss Dark Chocolate (Cocoa Mass, Sugar, Cocoa Butter, Soy Lecithin, Vanilla), Caramel (Corn Syrup, Sugar, Milk, Fructose, Hydrogenated Coconut Oil, Butter, Mono- and Diglycerides, Salt, Soy Lecithin, Vanillin), Sugar, Almonds, Peanuts, Hazelnuts, Butter, Coconut Oil, Cocoa Butter, Raspberry Puree (Raspberries, Sugar), Liquor Extracts, Coffee, White Chocolate (Sugar, Cocoa Butter, Milk Powder, Soy Lecithin, Vanilla), Natural Flavors.